Today’s business environment is mobile. It’s 24x7. It’s endless. And it’s relentless. Sales reps are expected to be available on the fly, ready to move a sale closer to completion no matter where leads may take them. The same goes for sales tools. Technology enables agility, allowing reps to engage with customers on their terms, wherever and whenever they are needed. Configure Price Quote (CPQ) software needs to be accessible to reps and other stakeholders wherever and whenever a sale takes a step forward in the sales funnel. Reps need to configure quotes. Managers need to sign off on proposed deals. Sales operations needs to make sure contracts make sense for the business. And it all needs to be done quickly. 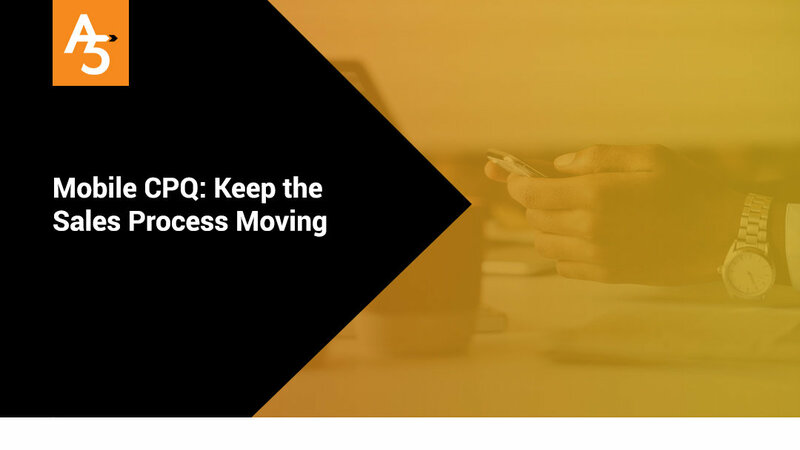 A mobile version of a CPQ solution would give organizations the flexibility they need to keep sales moving forward, but simply moving robust, feature-rich software to a mobile device isn’t exactly easy or recommended. Here are three things to look for in a mobile CPQ solution. Mobile CPQ solutions need to meet the needs of today’s modern, always-on workforce. Sales reps need to access quotes, configurations and other sales information through WiFi connections in coffee shops, home offices and airports or LTE connections in rural towns and faraway places. Mobile CPQ solutions should be simple and action oriented, allowing reps and other stakeholders to get pertinent information quickly without having to shuffle through long menus, complex spreadsheets or huge document repositories. They need to be able to quickly log on, find what they need and take immediate action to keep the process moving forward. Other, more complex or routine tasks can be completed later from a desktop or cloud-based version. Mobile CPQ solutions aren’t just for sales reps. Sales are just as dependent on other stakeholders throughout the sales funnel, and they need quick mobile access to keep the process moving. Everyone should have a seamless experience from the desktop or web version and the mobile version with information and tasks updating between the solutions. Critical and potentially bottleneck-inducing tasks such as approvals should be one-click, allowing the process to be shepherded through quickly and seamlessly. At the same time, CPQ solutions should include e-signature or docusign capabilities that can stand up to legal standards. Faxing and FedEx take time and require people to be in a specific place to keep the process moving. The ability to sign off on contracts, make changes if necessary and discuss edits with customers enables mobility—allowing reps to spend more time on the road where they can make additional sales. Mobile CPQ doesn’t have to be complex or bloated. A scaled-down version that focuses on keeping the sales funnel moving can go a long way in ensuring mobility and increasing productivity.